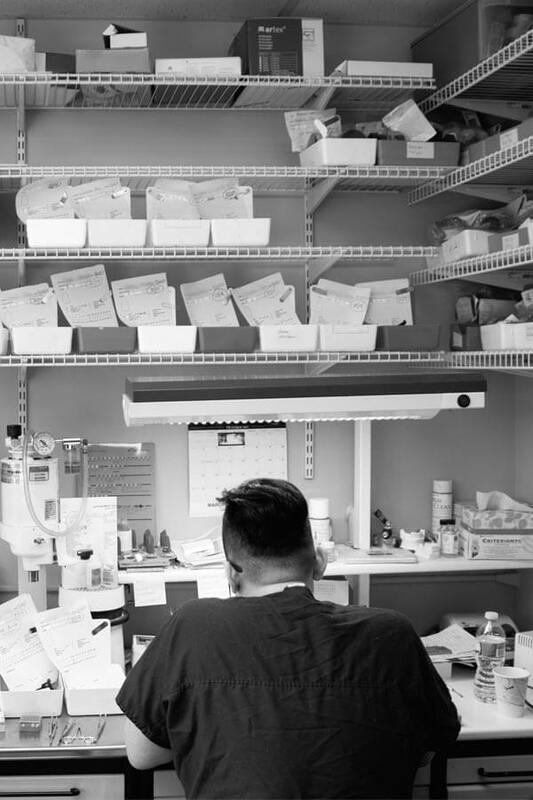 Our on-site laboratory is where custom, handmade craftsmanship combines seamlessly with technology to create smiles that are truly works of art. The creation of every restoration, from veneers to dental implant restorations, requires precise detail work and intense attention to detail. Our state-of-the-art facility is continually upgraded with the latest techniques, instruments and materials. We use high-level magnifying microscopes to see the smallest of details and computer-aided design and computer-aided manufacturing (CAD/CAM) to create the most accurate designs and precise fit. Advanced technology is not our only advantage. 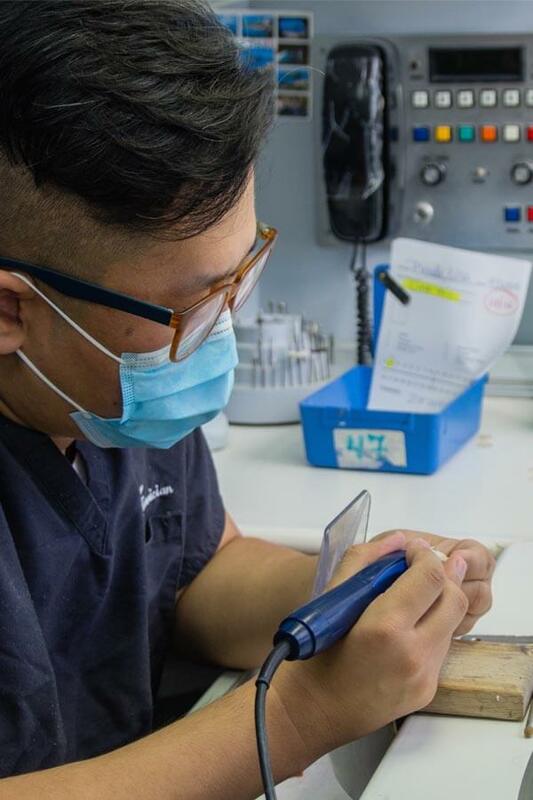 Unlike many dental practices that use overseas commercial laboratories, we craft the final touches of our restorations by hand. This allows us to ensure a truly customized solution for each patient. Our technicians use the best quality materials that are designed to mimic nature so that each restoration looks and feels natural. Our highly trained, artistic technicians also have the benefit of meeting patients in person. They can see how a patient’s teeth move when talking and smiling and examine the patient’s teeth for perfect color matching. Other practices that use offsite shade matching must rely on photography and computer monitor adjustments. An on-site lab also allows for our technicians to work side-by-side with the doctors to receive feedback at all stages of design and creation. In-person interaction allows for instant collaboration, clear communication, quality control, and teamwork. At Scarsdale Dental Associates, creating quality restorations that are natural-looking and long-lasting is critical to our reputation. Our laboratory, which is constantly upgraded in methods and materials, allows us to take implant, esthetic and restorative dentistry to new levels and provide a customized service to our patients. Hiromi Kawakubo hails from Japan where he lived with his wife Sumika. Hiromi taught dental technology, served as a US consultant for Noritake Dental, a dental materials manufacturer, and had a successful private practice. His wife, Sumika, trained with Hiromi and has become a skilled master technician under his tutelage. Hiromi and Sumika moved to the United States and worked in many exclusive dental practices on the West Coast. They had no intentions of leaving their home in California until their daughter Tamaki began demonstrating skills as a talented violinist and was invited to train with the finest violin teachers at New York City’s Juilliard School. The Kawakubos uprooted their family, left their established practice, and moved to New York. Today, Tamaki Kawakubo is now a renowned violinist who performs all over the world. After many years in New York, the Kawakubos moved back to California, but their dedication has remained with Scarsdale Dental Associates. Hiromi and Sumika have chosen to continue to work exclusively with the practice.